After a long working weekend, two of us headed west after lunch this afternoon to Saint Catherine’s Park, between Lucan and Leixlip, on the borders of Dublin and Co Kildare, for a brisk country walk away from the city. The park looks down to the valley of the River Liffey between Lucan and Leixlip, and includes the second part of the Slí na Sláinte 4 km walk. The park features include the remains of an old church and the former farmyards and entrance gateway of Saint Catherine’s House, once a monastery but now a boutique hotel. From the carpark, we walked to the Upper Yard and then found our way down a step and twisting path to an old penal church built in the 18th century. It was later used as a school from 1833 until the early 1900s and since fallen into ruins and is surrounded by fencing. Nearby the castellated ruins of the Lower Yard are also fenced off. But this is a beautiful 33-acre park. Although there are no signs indicating the historical value of any of these ruined buildings, there seem to be plans to restore them as part of the park’s attractions. The estate was given to the Kildare County Council by the Irish Government after the demesne was acquired by the state. It is located in three county districts: Fingal, Kildare, and South Dublin. Saint Catherine’s Park takes its name from a Priory of Canons of the Order of Saint Victor, which was established there soon after the arrival of the Anglo-Normans. The original priory house was built on each side of a small stream that descends to the River Liffey. The Priors of Saint Catherine’s included William of Kill, John Warisius, and Richard Shirman, and the chief benefactors of the priory included Wirris de Peche, Lord of Lucan, and Sir Adam de Hereford, Lord of Leixlip, each of whom left an endowment to maintain six chaplains to pray in the priory for the members of their families. The priory was so impoverished by the early 14th century that the Prior, Richard Turnour, and the canons obtained a royal licence in 1323 to assign the priory and all its possessions to the Abbey of Saint Thomas in Dublin. After the dissolution of the monastic houses, the priory house and lands were leased in 1541 to Thomas Allen, Chamberlain of the Exchequer, who was also granted the neighbouring monastery of Saint Wolstan’s. When Allen’s lease ran out in 1561, the priory house and lands were leased to George Staynings, and eventually it passed to Sir Nicholas White, Master of the Rolls, who was granted “the Cell of Saint Catherine’s,” along with the Manor of Leixlip. Saint Catherine’s Priory became White’s principal residence. But he fell out of favour and in 1589 he was sent to London, where he was detained first at Charing Cross and then placed under house arrest in the house of the Dean of Saint Paul’s Cathedral, London, before being imprisoned in Marshalsea, and then in the Tower of London. When he was released, he was allowed to return to Ireland and he died in February 1593. His son Andrew White and grandson, Sir Nicholas White, lived at Leixlip Castle, and during the Cromwellian era Saint Catherine’s was leased by Sir Robert Knight. In 1655, the White family sold Saint Catherine’s to Alderman Ridgely Hatfield, who was Mayor of Dublin the following year. After the Restoration, Saint Catherine’s was sold in 1664 to Sir John Perceval. It then passed to Sir William Davys, who was Attorney-General and Chief Justice of the Regalities of Tipperary Recorder of Dublin, Prime Serjeant, and Chief Justice of the King’s Bench in Ireland. He was a son-in-law of Archbishop Boyle of Armagh, and later, when he was widowed married a daughter of the Earl of Kildare. When Davys bought Saint Catherine’s in 1666, the buildings had fallen into disrepair, and he rebuilt the house. For generations, the house remained in the hands of the Davys family, who received the titles of Baron and Viscount Mountcashel. When the family died out, Saint Catherine’s passed to Sir Samuel Cooke, who was twice Lord Mayor of Dublin and married Judith Trench, daughter of the Very Revd John Trench, Dean of Raphoe. His grand-daughter, Mary Welden, married her cousin, the Very Revd Thomas Trench, Dean of Kildare. Saint Catherine’s Park was rebuilt in 1765, and became a home of Sir Richard Wolseley of Mount Wolseley, MP for Co Carlow, who died there in 1781. By 1795, the house had been bought by Robert Butler, third Earl of Lanesborough, who built considerable additions to the house and modernised the older parts of Saint Catherine’s. It then passed to David La Touche of the Huguenot banking family, who was related by marriage to Lord Lanesborough. When the house was burned to the ground and a new house – also called Saint Catherine’s Park – was built around 1798, designed by the architect Francis Johnston. 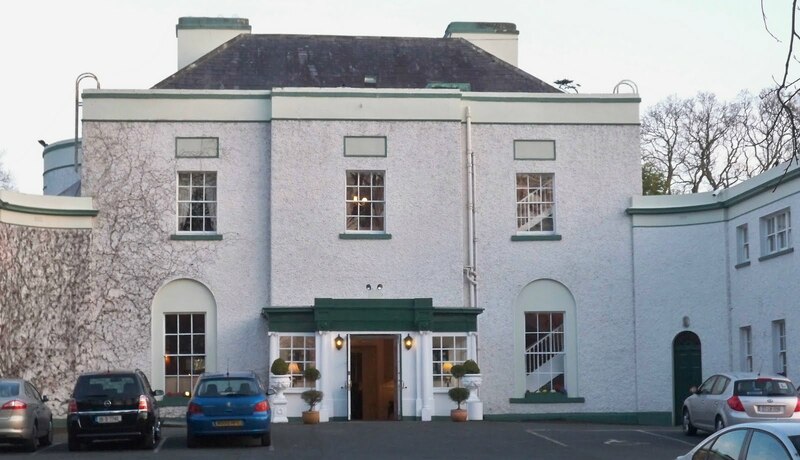 A boutique hotel since 1996, and it was known as the Liffey Valley House Hotel when I attended a wedding there in 2010. It was relaunched in 2011 as a private wedding venue and renamed Leixlip Manor and Gardens. From Saint Catherine’s Park, we drove down the steep hill that leads down to the banks of the River Liffey and the weir and bridge at Lucan Village. The bare winter branches provided a clear view down the river to Lucan Bridge spanning the River Liffey. This is the largest single span masonry arch bridge in Ireland. It is built with ashlar masonry and has a span of 33 metres (110 ft) and a rise of 6.7 metres (22 ft). It is framed by iron balustraded parapets made by the Royal Phoenix ironworks in Parkgate Street, Dublin. The bridge was designed by the architect George Knowles and was built in 1814 in collaboration with James Savage to replace several previous bridges that had been carried away by floods. This 1814 bridge built by Savage and Knowles has been largely unaffected by the flooding on this stretch of the river. By now, it was cold and darkness was closing in. It was time to think of dinner and a restful evening before the beginning of a new semester tomorrow morning.